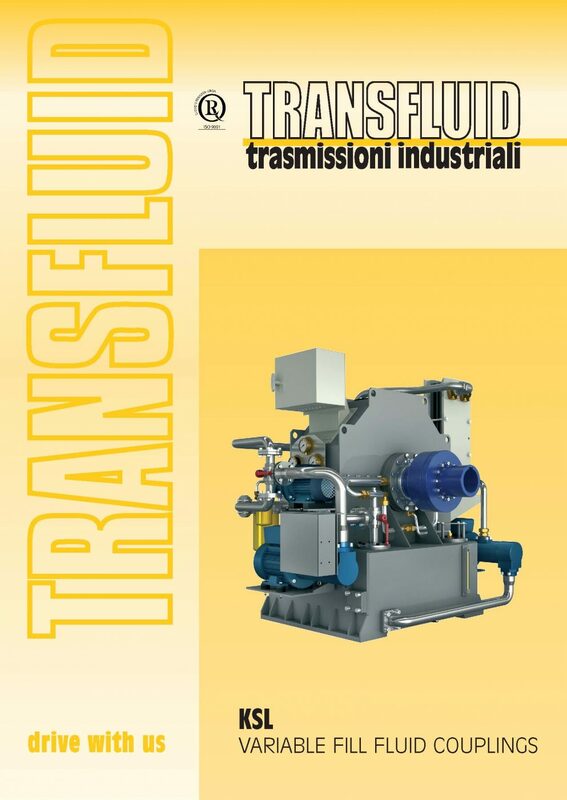 Transfluid has designed their KSL series variable fill fluid coupling to overcome problems experienced at “start up” and “speed variation” operation for medium and high power machines, driven by electric motors and internal combustion engines. Extremely efficient perfomance is achieved operating the KSL’s very simple and effective principle. Oil, that’s the power medium, is pumped from a sump to the hydrodinamic coupling circuit, where it is finally “drained off” through a series of orifice plugs, back into the sump. By controlling the coupling’s feed pump oil flow to the working circuit by a small A.C. frequency converter, changes occur inside the coupling working circuit which alter the coupling slip characteristics and this softens the “start up” dramatically. The same principle used to control the start-up permits the KSL to operate as variable speed drive, varying the speed between input and output. Another KSL feature is its ability to limit the torque transmitted, slipping for a time and then dumping its circuit oil, disconnecting the driven machinery. The quick disconnection is possible by installation of quick realease valve. The KSL’s fluid coupling working circuit is gradually filled with oil from an empty condition to a fully filled condition. Such behaviour enhances an extremely soft controlled start up, especially with high inertia machinery. The KSL’s variable oil feed system is controlled by a frequency converter during the ramp up, producing the ideal soft starter. By operating either manually or by the frequency converter controller, the KSL always guarantees output speed accuracy, as required by operator or control system. One of the most important characteristics of KSL fluid coupling is its torsional vibration dampening effect, protecting both the driven machine as well as the motor or engine. This is a fluid coupling peculiarity and a big benefit to users. Even more protection can be achieved by installing “quick release drainable valves” which discharge oil from the working circuit in a few seconds, limiting any prolonged overload period completely. The KSL is an extremely efficient device compared to the constant filled type fluid coupling, as its volume of working ciruit is controlled at the fullest possible volume to mantain a very small slip rate. These make the KSL series a low maintenance piece of equipment. Thanks to its split casing design, it’s possible to remove the complete fluid coupling impeller assembly without having to move either the motor/engine or driven machinery, saving the need for realignment and costly down time. In addition all the accessories are externally mounted allowing an easy and fast replacement in case of need. Drive and driven shaft dimensions and tolerances. A coupling KSL used as a speed controller on a large fan for smoke removal. 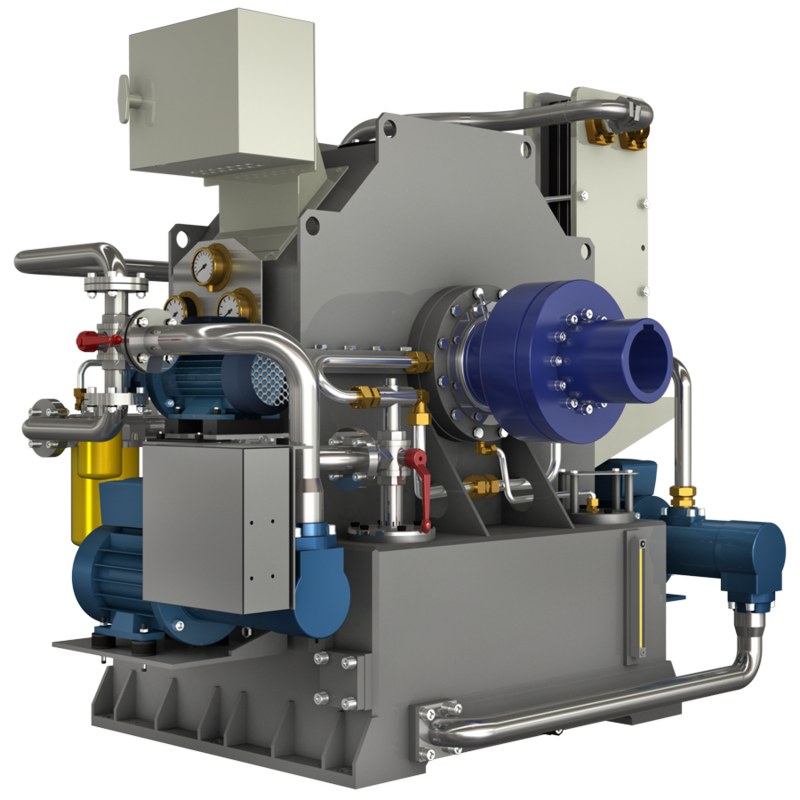 The heat exchanger is an oil water type. It can be noted the compact nature of the coupling compared to the dimension of the electric motor. This speed controller for a fan is installed in a smoke blower in an incinerator. The KSL coupling used as a speed controller runs 24 hours per day, 7 days per week and the only time it is stopped is during routine maintenance. Speed controlled fan used in the production of lime. This coupling has run uninterrupted for 56.000 hours as a speed controller. Only general long term maintenance, such as filters, seals and bearings have been conducted. The use of the KSL as a speed controller for centrifugal pumps and fans is particularly convenient and reliable since problems with EMI are avoided as the unit is driven directly from the main motor. The maintenance is extremely simple and can be performed without the need of highly specialized personnel. Mill Mixer for the preparation of raw material to produce ceramic tiles. Double drive through the KSL coupling used to drive a mill for ceramics. Speed controller installed on a fan in a steel production plant. Speed controller on a fan in an electrical generation plant in Brazil. This plant is in service since 1994 without fluid coupling or accessory problems. The connections between the motor, coupling and fan has been realized by gear couplings. Speed controller for a fan installed in a mine in Australia. A closer look at the fluid coupling KSL shows a centrifugal pump (lower portion) used to circulate oil in the heat exchanger. The feed pump (in center) is used to control the fill of the fluid coupling. Partially hidden, behind the three way valve are the filters and lubrication pump. This installation is valued for its sturdiness, low noise and simplicity to place in service.